One MVWSD. One Team. One Plan. Additionally, the District annually updates its LCAP (Local Control Accountability Plan). Since the LCAP and Strategic Plan will cover similar topics, work will be done on both simultaneously. The entire process will be driven by stakeholder feedback. 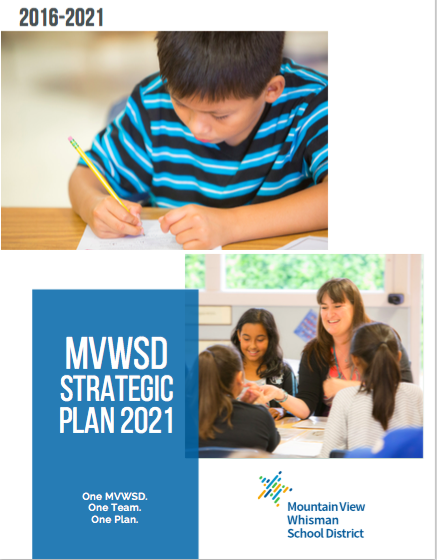 In 2015, MVWSD completed its Google-sponsored comprehensive review of every school, division and program with the goal of clearly understanding our opportunities for growth and developing plans of action for improvement. Independent reviewers met with teachers, parents, students and community members and observed in classrooms. A School Quality Review (SQR) for all the elementary and middle schools, as well as a District Quality Review (DQR), has been completed. For his first 100 days, the Superintendent listened and learned. His observations and interviews done as part of the 100-day plan (English) (Espanol) resulted in a summary of findings, Superintendent's 100-day Report (English) (Espanol). The District is also working simultaneously to update its Local Control Accountability Plan. All of this data will be used in development of our District's Strategic Plan 2021 - a five-year blueprint on how the District will close the achievement gap while assuring high levels of learning for all students - to be completed by May. A group of more than 100 people (including parents, students, teachers, administrators, community members, nonprofit organizations and representatives from businesses such as NASA, Synopsys, Microsoft, Veritas, and Linkedin) participated in strategic planning sessions in March. The group thought about and discussed deeply their ideas of ideal competencies and attributes of students. These key concepts will help to develop the District's new vision and mission, and later on, the goals and strategies that will guide the work. Four groups spent more than 15 hours in April 2016 sessions working on important elements of the Strategic Plan 2021. Stakeholders including parents, students, teachers, administrators, community members, nonprofit organizations, business representatives and the Board of Trustees worked on vision, mission, and goal statements. They also further defined the Portrait of a Graduate and developed strategies, desired outcomes, and action steps that will take the District from its current state, to the ideal state as envisioned by more than 100 stakeholders in day-long sessions in March 2016. These sessions are just part of the data used to inform the strategic plan. There were also interviews as well as the independent District/School Quality Reviews that included many, many interviews and data points. Each stakeholder group has contributed to both general elements in the plan, as well as details unique to a group’s expertise. The result is Strategic Plan 2021 that draws on the strength of our District’s community.